Restaurant and Saloon, serving lunch and dinner. Each side has two double beds (linens supplied) with a privacy wall between them, but open to the living room. You can sleep up to 6 people by utilizing the fold down futon couch. Each cabin has a TV with DVD,ceiling fan, kitchenette and breakfast nook complete with hot plate, microwave, fridge, toaster, coffee maker and sink (with a few essentials supplied). Cozy warmth provided by a propane gas fireplace. Each cabin has its own bathroom, including shower (towels furnished). These cabins also have outdoor grills and decks. Two newly built sleeping cabins. Each cabin has electricity, one queen size bunk bed (with fitted sheets, pillows and pillow cases only), TV with DVD, ceiling fan, dorm fridge, table, coffee pot and electric fireplace. The campground restroom, laundry and shower house is close by. Please supply your own towels, linens and blankets. Two newly built sleeping cabins. Each cabin has electricity, two full size beds (with fitted sheets, pillows and pillow cases only), TV with DVD, ceiling fan, dorm fridge,Air conditioning, table, coffee pot and electric fireplace. The campground restroom, laundry and shower house is close by. Please supply your own towels, linens and blankets. *Since we are located at 5,500 feet of altitude, when the sun goes down most summer nights you'll need a jacket to sit around a campfire. 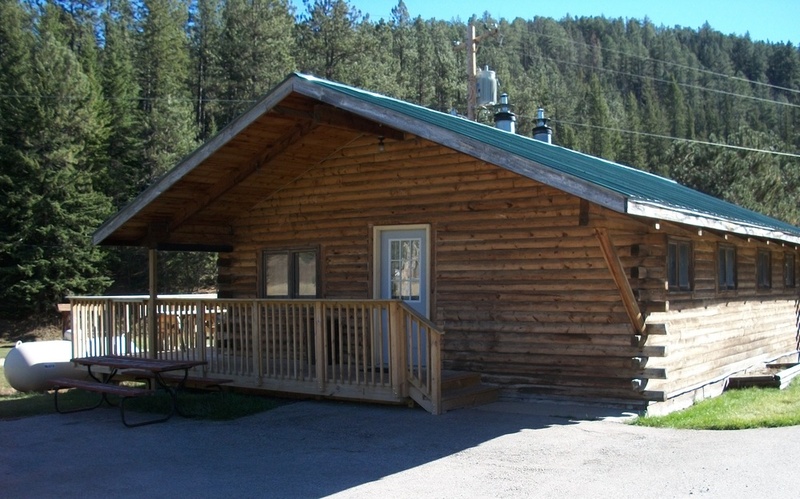 Fire pits and picnic tables are located at each cabin. Pets are welcome, but must be on a leash and can not be left in your camp unit when you're away Dogs bark and disturb other guests when unattended. The person, or persons, making the reservation is responsible monetarily for damage to the building, furnishings, and/or property.